MOJAVE, Calif. -- Dec. 12, 2013 -- In one year, Northrop Grumman Corporation (NYSE:NOC) took a satellite communications system normally used in space and transformed it into a high-functioning, low-cost communications system that can be used on aircraft. The satellite communications (SATCOM) system was successfully demonstrated on board the company's Firebird demonstrator aircraft. Until now, no small communications system has been able to send sensor data to a satellite and back to a ground station at such a high rate of transfer. 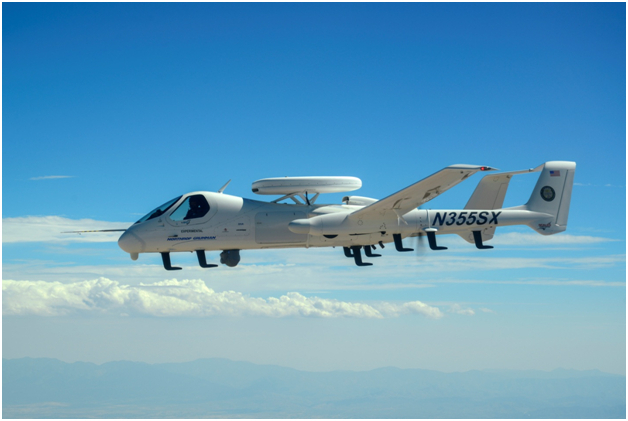 "It's a game changer for those that need high-quality, real-time data, but don't want to â or can't â have a large, heavy communications system onboard," said Brett Amidon, director of Technology Development at Northrop Grumman's Aerospace Systems. "Our system provides beyond line of sight capabilities in a compact, lightweight, low-profile package." During the demonstration, the SATCOM system rapidly provided full-motion video to the ground. For demo purposes, the system and associated test equipment were housed within a pylon-mounted structure attached to the top of the Firebird fuselage. The system's small size saves a great deal of space, allowing more sensor payloads and equipment to be carried by the aircraft. Northrop Grumman developed the SATCOM system using Gallium Nitride (GaN) technology, which first gained attention as the source of brightly colored LED lights. GaN allows for high communications output while using very little physical space.